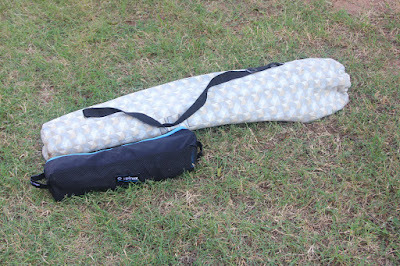 Here’s a story somewhat like my purchase of the Sea-to-Summit Thinsulite Reactor sleeping bag liner. I have ogled the Helinox Camp Chair for years, but could never justify $140 for a camping chair, but then three things conspired to change my thinking. My Coleman folding chair was years old, had been repaired multiple times, was heavy but study, and while it is easy to repair, it continues to shed part. Second, I’ve watched Larry Ricker, nibimocs, sitting comfortably at his campsite in numerous videos, even holding his dog in his lap. I think Larry said he had a different model, but for all intent and purposes, they look and work the same. Each video made this chair seem all the more appropriate for paddle/camping. Thirdly, I received an email offering an enticing sale price. Even then, I looked at the ad every day of the sale before making the plunge only hours before the sale ended. it very easy to put the chair in. Here is a comparison between the two chairs, my current Coleman and the Helinox. Why I couldn’t stand being tempted any longer becomes apparent. The Coleman Max Quad Chair is $40, 10 lbs., steel construction, 8 X 38 in. packed size, oversized feet, oversized seating with drink holder in each arm, 600 pound capacity, with a 24“ seat height. 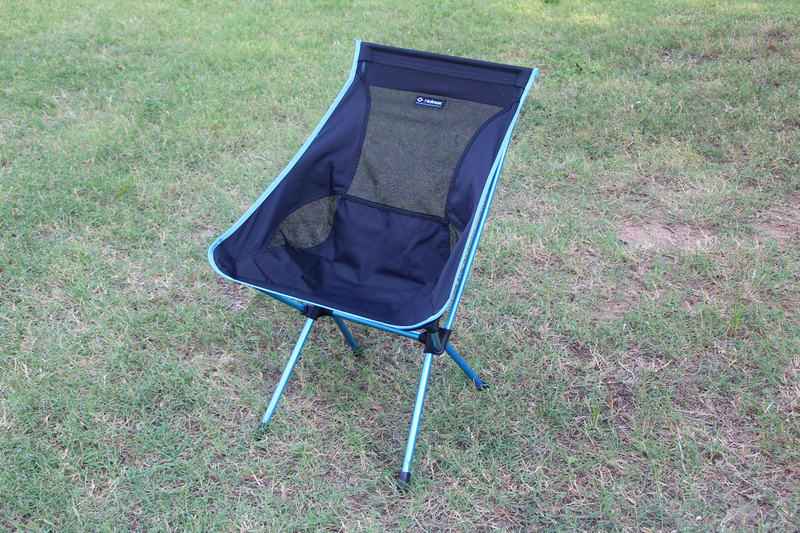 The Helinox Camp Chair is listed at $139.95, 2 lb. 9 oz., sturdy aluminum & polyester seat, 5 X 20 inches packed, 18” seat height, 320 pound capacity. The two photos here show the best comparison between the two. For packing efficiency, the Helinox is half the size and a quarter of the weight of the Coleman. The Coleman is still serviceable, and serves well at an RV site or if we travel to an athletic event or something similar, but it is a load in the canoe, and would be next to impossible on a kayak, and therefore gets tied on top of everything else making the boat top-heavy. Instead of being tied on top of the canoe packs, the Helinox slips lightly and comfortably in with my sleeping bag. The combination of pack-ability and lightness finally scored a win.